I would hazard a guess that the majority of us have introduced a little bit of Bohemian style into our homes without even realising it. Remember there are no new ideas, just reinvented ones – I am happy to say though that these are usually improved upon versions. The hippy days of the late 60s and early 70s are back with a vengeance. Combi vans are much sought after and are being lovingly restored and the idea of taking life at a slower and happier rate is all the rage. 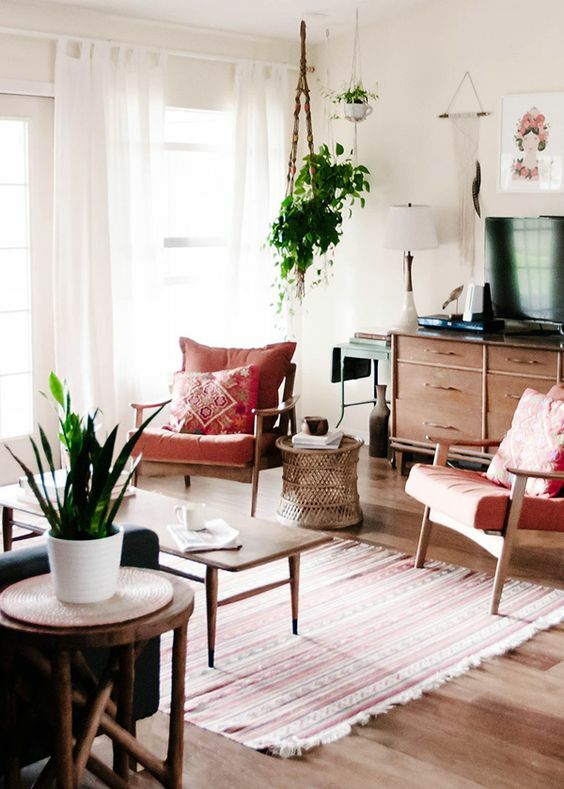 What is contemporary Bohemian Style? 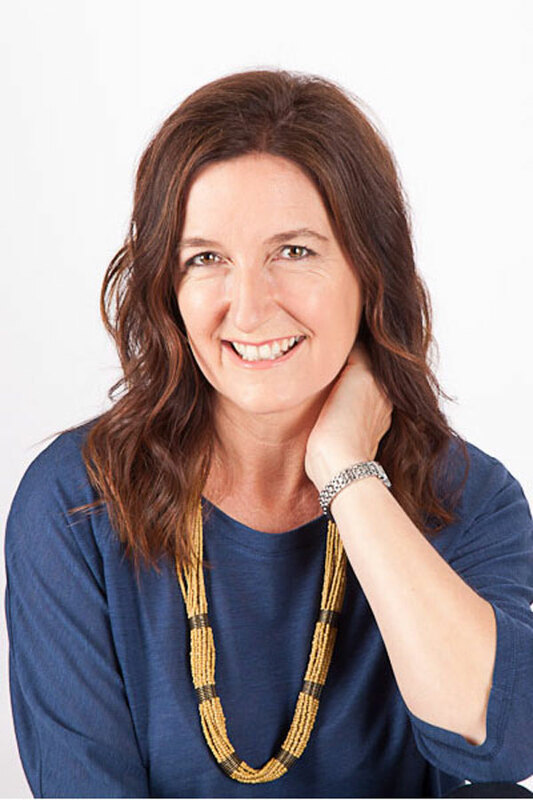 You only need to put Boho style into a search engine and you will see gorgeous fashion that is individual and relaxed – I just hope though that the power days of the 80s with their shoulder pads are not going to follow! 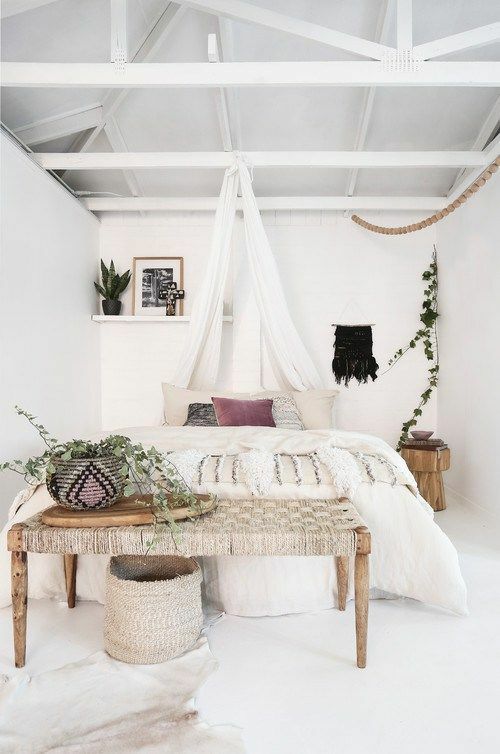 Looking at Bohemian interiors, you see a vast range of styles from beautiful Moroccan inspired schemes that are bursting with colour and pattern, interiors that are inspired by the gorgeous rich and colourful textiles of the Sub Continent and a Mexican flavour too, depending upon the part of the world you happen to be in. I have noticed lately though that Boho style is getting a makeover and although the beautiful flashes of colour are still apparent, the look is a little more pared back. I call this Contemporary Bohemian Style. Furniture. 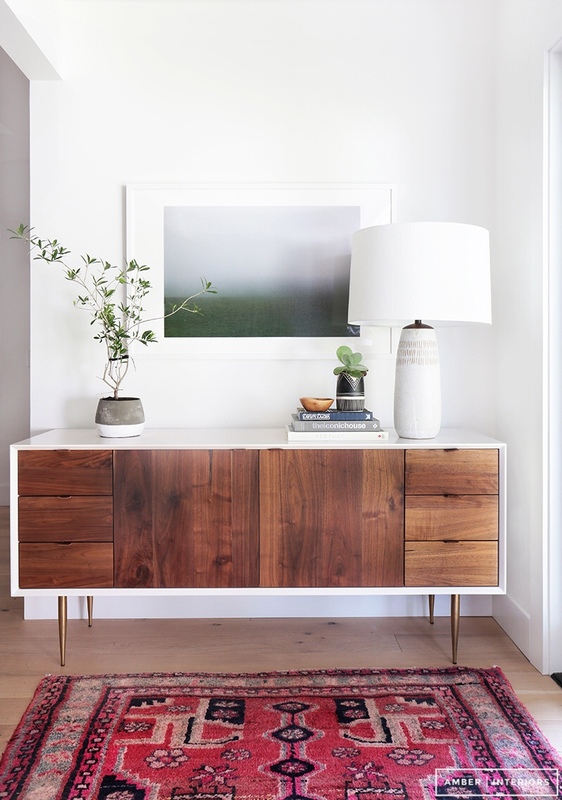 A Bohemian style interior is not complete without a statement piece of Mid-Century style furniture. This could be a sideboard, dining table and chairs or even just some accent pieces – a coffee and side table. 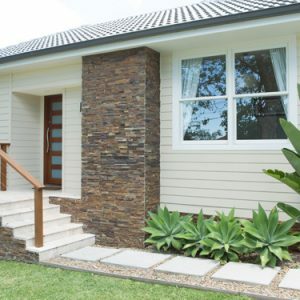 Partner with comfortable contemporary sofas and non-matching occasional chairs and incorporate relaxed style items like floor cushions, rattan stools and foot rests. Colour. This is an essential ingredient in a Bohemian style scheme. The thing about contemporary Bohemian interiors is that you introduce colour from cushions, rugs, kilims and artworks but you pare it back slightly. 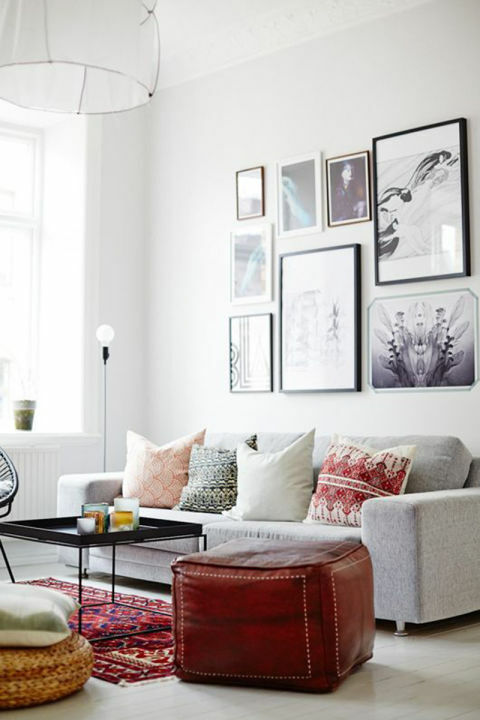 Rather than the full on jumble of colour that a traditional Boho style commands, a modern version relies more on varying levels of white, in fact pretty similar to Scandi style. These two really do crossover and I often find that people like both and often start with a Scandi look but add interesting pieces to make it more of a Bohemian look. Rugs. 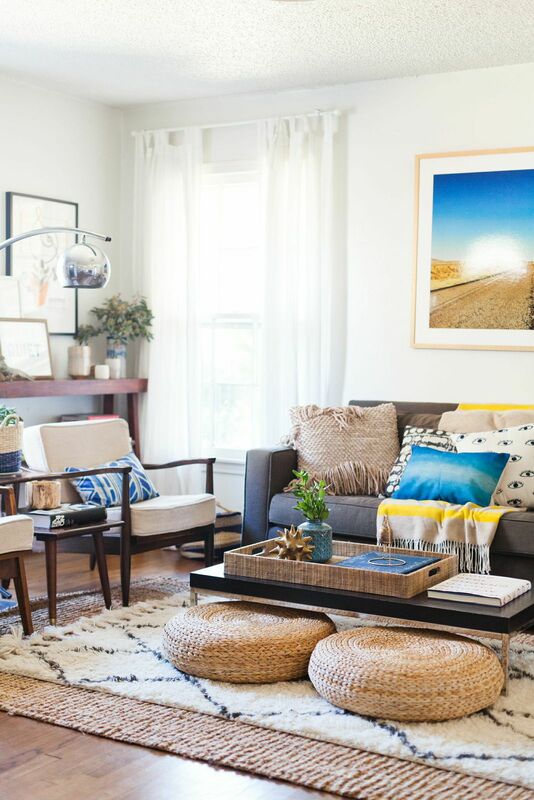 Rugs in one form or another are also an essential for a Bohemian style. The more traditional look with strong colour and pattern works really well but you can also rely on simple geometic patterns and textured rugs to make an impact. The main point is to avoid traditional wall to wall carpets as this really doesn’t suit this style. 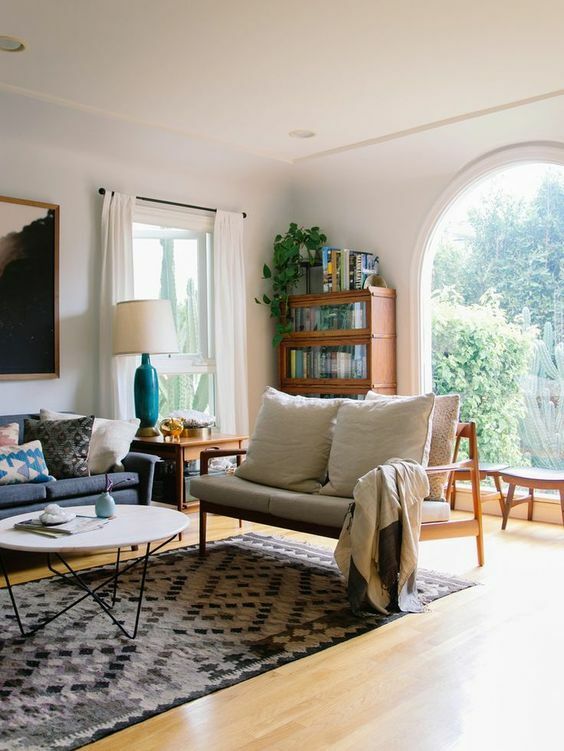 I’ve noticed a recent trend of layering rugs with a large simple rug filling the space and a smaller accent rug on top. 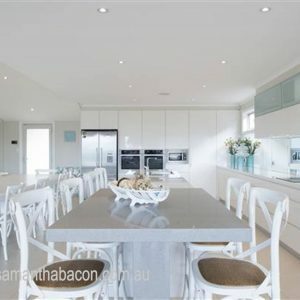 This is a great idea to bring interest to a scheme, particularly if you are using a lot of white as these looks rely heavily on layers of texture for their success. Finishing Touches. The finishing touch though really brings this all together and a contemporary Bohemian style would not be complete without some greenery, preferably in large rattan baskets or in braided macramé ceiling hangers, interesting artefacts collected from your travels, beautiful vintage colourful porcelain and pottery and of course, the ubiquitous guitar. Even if you don’t play, pick one up from a vintage store as your look is incomplete without one! 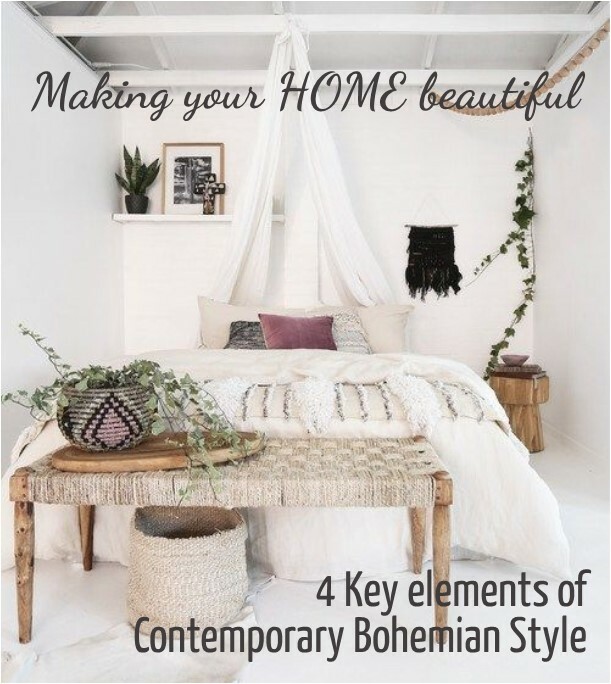 I have put together some of my favourite images of Contemporary Bohemian Style below which demonstrate my 4 key elements – I hope this gives you some inspiration for your home. 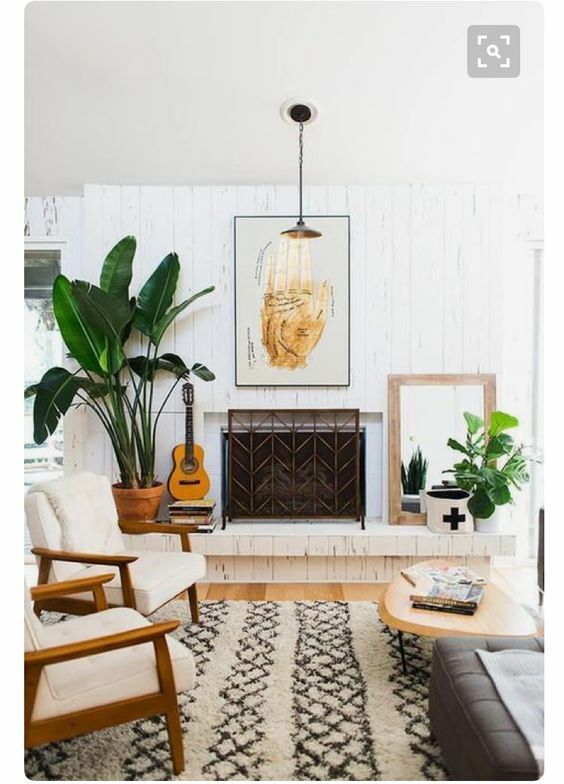 I love this cosy room with some Mid-Century chairs, geometric rug, fresh white paint, greenery and the guitar! A classic contemporary Bohemian room with personality and style. Here is a great example of some layered rugs which I think makes the room interesting and cosy – it would be great to hear your feedback on this design element as it will be interesting to see whether it takes off. Beautiful colour introduced with cushions and interesting artefacts – a very personal and individual space. 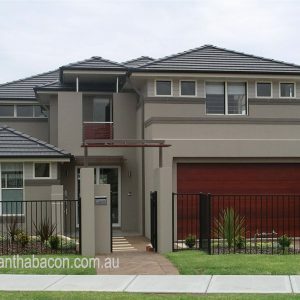 Do you love this style? 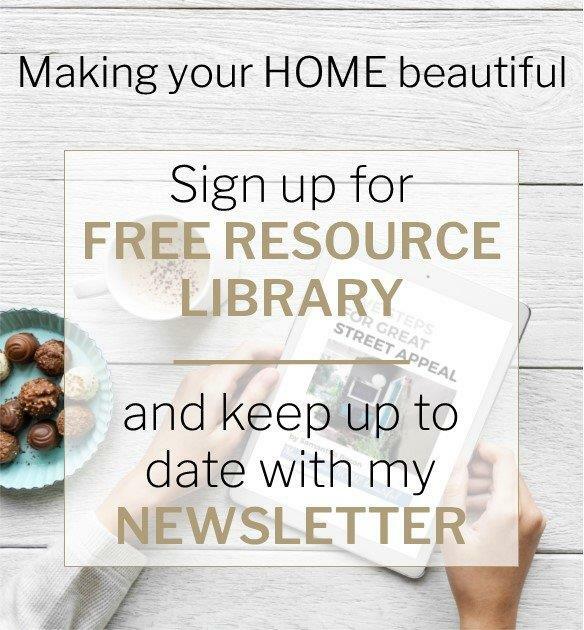 I would love to hear if you have used this in your home and whether you have incorporated any beautiful pieces from your travels. 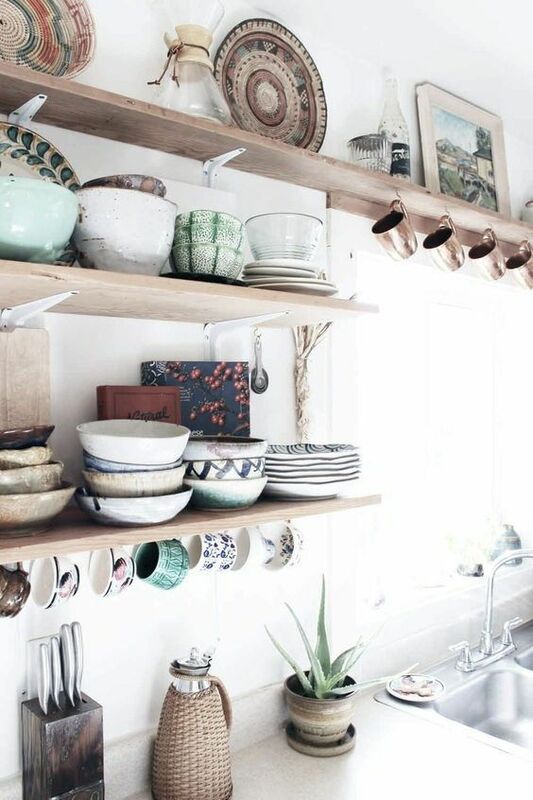 This style really lends itself to displaying all of these beautiful items which often can end up tucked away in cupboards. The beauty too of this look is that nothing has to be too perfect. Pieces don’t have to match or be expensive and this is therefore an excellent style to introduce into your home if you want to project your personality into your interior schemes. 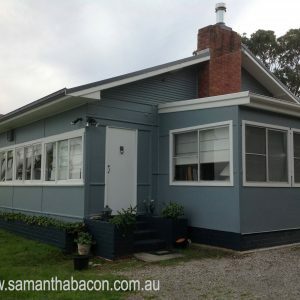 Something I think we should all be doing more of to make our homes happy and comfortable. 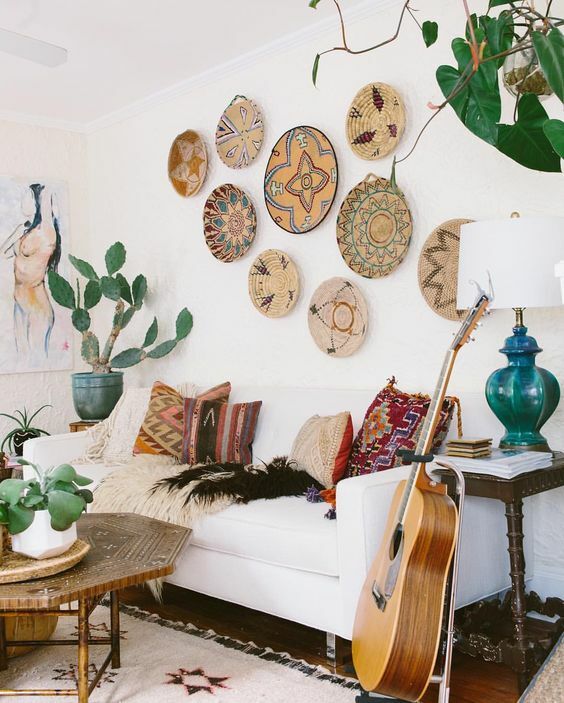 For me the plants and rugs are essential for each boho designed room. Using different colours is also very beautiful and can be creative! Thank you for sharing those tips. Finally! A name for my style! Thank you. Do you know where/how I can purchase the white/wood wide dresser with brass legs in your first picture (Amber designs).